Formulating the right message and delivering the message in a way in which students will not only notice but respond to is vital for a successful campaign. This market is apt for being more creative with your ideas and being more exciting in your marketing methods. We have found that campaigns with some form of drama, jeopardy or gamification associated to them gain significantly higher levels of engagement and enhanced results. For brands with the budget you can truly go all out, the possibilities are endless! But in reality it isn’t about being spending a small fortune on an experiential activity. Effective engagement doesn’t have to break the bank. Simple, honest and fun are three powerful words when it comes to creating a student marketing campaign. Create a promotion that gives something to the student, something they can engage with, something they can interact with and get involved with, something that will leave a lasting impression. Our experienced and creative team can deliver engaging campaigns from developing content right through to creation. 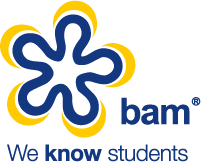 From the initial engagement idea to the final activation, BAM have the knowledge and expertise to bring any campaign to life. Check out some of the amazing concepts brands brought to University campuses across the UK last year in BAM’s Freshers Tour 2017.